Your corporate office furniture and design not only affects the atmosphere and appearance of your company, it also plays an important role in the productivity and morale of your employees. The right office furniture and design can give your business a fashionable, up-to-date look while making things more comfortable for employees and clients alike. Equally important, the right office furniture and design can help you attract and retain talented employees, as ergonomics tells us comfort and flexibility are growing increasingly important to millennials in or entering the workforce. 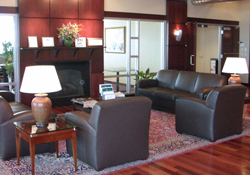 Buffalo Office Interiors specializes in providing professional, elegant designs that will help lead to increased productivity and morale, and give your business a prestigious look and feel. We keep our eye on the latest trends to shape the business world, including furniture furnishings, art, flooring, architectural finishes, wallpaper and more. Every aspect of your office design, from the colors and fabrics you choose to the artwork on the walls impacts the atmosphere and productivity of workers and affects the impression you give clients. That is why we pay attention to every detail to create a cohesive theme, while making sure your office doesn’t fall behind the times. We use the latest industry innovations from trusted brands such as Haworth and Hon. Our experts will help make your workplace more mobile and less stationary, which encourages collaboration and teamwork. From remodeling and revitalization to a trendy update to a completely new look, our designers will make as few or as many changes as you need to accomplish the look you desire. We work closely with our clients to help make their dream workspace become reality, all while staying in budget. From conference rooms to training rooms, lounges and breakrooms, private offices, work stations, reception areas, lobbies and more, we can redesign any space and create a look that is impressive, professional and cohesive. Let us help you create a wonderful work environment that will lead to increased productivity and will receive favorable first impressions from your clients. For more information on corporate office furniture and design updates or remodeling, contact Buffalo Office Interiors today at 716-883-8222.